All Sterling’s automation systems are custom engineered and manufactured to meet exact customer requirements. The Grinding process increases process efficiency and improves conditioning in many production operations, such as in a Feedmill. Grinding performs particle size reduction. Why? For example, in feed production Grinding creates more surface area which aids in the digestion of the feed. Fracturing of the solid material occurs in the Grinding process, resulting in both an increase in material surface area and dissipation of heat. Whether you use a roller mill, a Hammermill or something else in your process, Sterling Systems & Controls, Inc. automation and process control systems automatically optimize the Grinder operation within the overall production process and automation system to meet specific size requirements; example: adjusting gaps in roller mills to achieve a specific micron size. This also includes setting or programming the Mill Type, Grinding Rate, Loss Factor and Source/Destination Ingredient, along with providing feeder speed control based on the type of material, type of grinding mill, and the transfer of the material to the next part of your production process. Runs automatically and keeps Ground Bins full: Automated scheduling of grinding and transfer processes ensures destination ingredient bins remain full with destination ingredients. 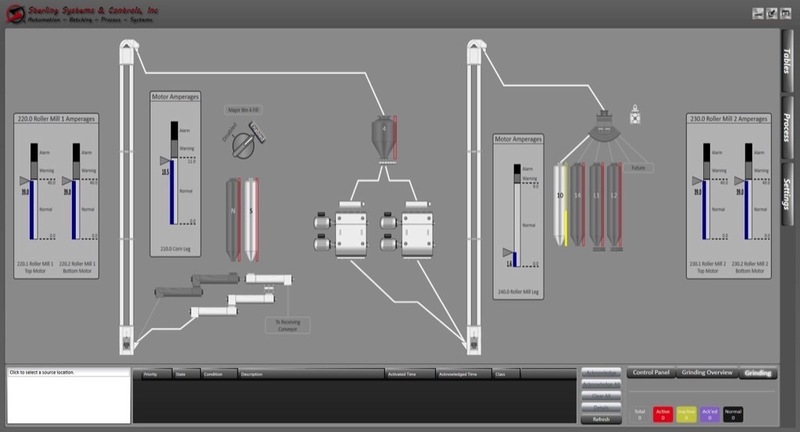 More information on the Grinding Automation Application is available from Sterling Systems & Controls. With more than forty-five years of experience providing efficient solutions for plantwide and process control and automation, process equipment, batching, micro, minor and bulk weighing, bag unloading systems, bag loading, bag dumping, Sterling Systems & Controls, Inc.’ custom designs utilize the latest technology to provide specialized data management, raw material management, along with production data tracking.